Heart healthy and totally yummy these scoops of blueberry and oat love are great served warm or cold. They are a wee bit tart and a wee bit sweet, my favourite dessert combination. Serve it warm and just scoop it out into a small dessert bowl or serve it cold the next day and it’s more like a square. 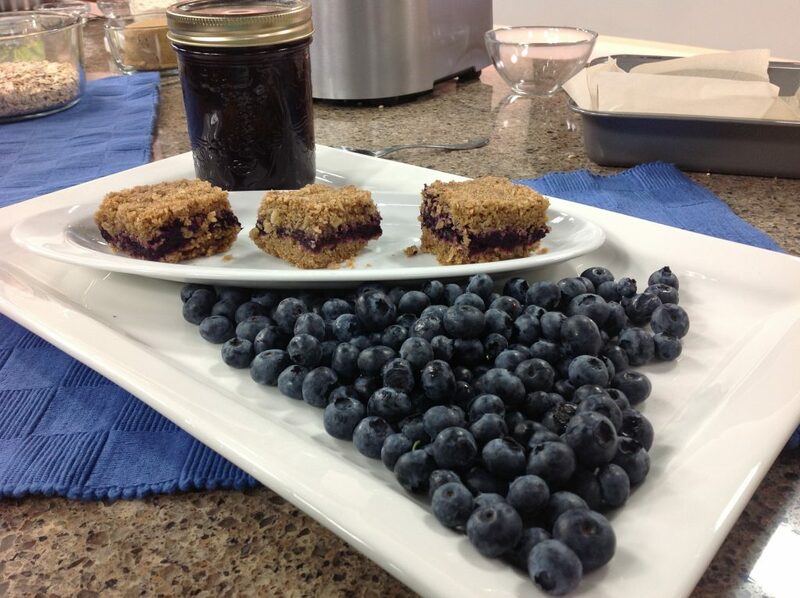 Professional Home Economist Tip: Make the Blueberry Filling at least an hour before and let it cool in the fridge. 1. For the Blueberry Filling: In a large saucepan over high heat bring the blueberries, lemon juice, and sugar to the boil. Reduce to medium and gently boil, stirring occasionally for 10-15 minutes, or until the berries have popped, the mixture has thickened and has reduced by half. 2. In a small bowl mix together corn starch and water. Add to the hot sauce, bring back to the boil and stir until the sauce has thickened and is shiny. You should only end up with about 2 cups (500 mL) If you have a lot more than that (and I’m really hoping you don’t), use it to top some yogurt but don’t add it to the squares they will become too soggy. 3. Pour the 2 cups (500 mL) into a container, cover and cool in the fridge for at least 1 hour before continuing on with the recipe. 4. One hour later – at least – Preheat the oven to 350°F (180°C). Line an 8-inch (2-L) metal pan with parchment paper. 5. For the Base: In a food processor whirl 1 cup (250 mL) of the large flake oats until they resemble flour, it takes about 1-2 minutes. 6. Add oat bran and pulse for 10 seconds. Add brown sugar, cinnamon and oil. Pulse until it looks like wet sand. 7. Add the rest of the oat flakes and gently pulse until mixed together and you can still recognize the large oat flakes. 8. Pour half of this into the bottom of the pan and firmly pat down. Pour in the entire Blueberry Filling and spread evenly, leaving a tiny edge of bottom crust showing. Spoon the rest of the oat mixture over top, and gently even out. Lightly press down. 9. Bake for 40-50 minutes or until golden brown. Cool. 10. To serve using a large spoon and scoop out 1/16 as a serving into a small bowl or a small plate. The recipe looks tasty and I happen to have most of the ingredients in the house so shall give it a try today. And lovely photo too Mairlyn! (I don’t have lemons but shall throw caution to the wind and substitute with limes).